Mare Barrow is a Red. In a world ruled by elite Silvers, her and her family live day to day on their meagre income- and what Mare steals. The Silvers, on the other hand, are rich and powerful, and all are ruled over by the King. After an encounter with a stranger, Mare finds herself in the heart of the Silver power- in the palace- as she miraculously gets a job to serve in the kitchens. At the palace, Mare is exposed as a Red with Silver abilities. In order to protect her- and to watch her closely- the King makes Mare stay at the palace and forces her to get engaged with his second son, Maven. His first son happens to be the stranger who helped her get the job in the first place. Stuck at the palace, Mare finds herself at the heart of a Red revolution- and also stuck between the two princes. I read this book in one day. It’s been so long that a story gripped me like this, and I loved being swept away with Mare, Cal, Maven, and the other characters. This book started off reminding me a lot like Hunger Games. The way the society was set up, it was similar to the districts of HG and especially the way Mare was written- a rebel, an outcast, even with her own family, and a girl looking for change. When her friend, Kilorn, is conscripted into the army, she vows to help him avoid it, by running away. That part again reminded me of HG and Katniss taking the place of her sister. It also reminded me a lot of Red Rising, especially in the division of classes. Red Rising also had a class of Reds, who were lower and who eventually revolt. This setup was practically the same. But when Mare got to the palace, things changed. She discovers that Silvers have powers, different things they can do, which makes them superior from Reds. Mare is a Red with powers and that makes her valuable to the crown. The King basically gives her a fake identity, and tells everyone she’s a long lost Silver princess who grew up as a Red. This is a way for him to subdue the Reds, by giving them a mascot to root for. Again, this reminded me of Katniss. Mare becomes a symbol for the Reds, like Katniss became a symbol for the other districts, simply because she’s different. The romance isn’t a major part of the story, which I didn’t mind. I don’t want to spoil anything, but you start rooting for one prince, only to switch halfway through, only to be caught completely off guard by the ending. It was definitely a surprise! The world that Aveyard has created is rich and detailed. Mare discovers that there are shades of grey to the Silvers too. She comes into the world thinking that all Silvers are the same, much like Darrow in RR, but then discovers that there is a power struggle among the Silvers too. There are those that are just and know that the class system is wrong, and then there are those who want absolute power. 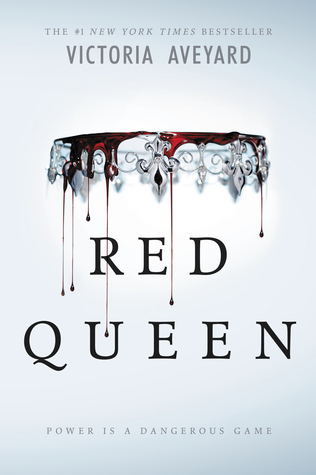 Red Queen was a fast-paced read, with interesting characters, and a rich world. I can’t wait to read the sequel!